Several ladies have been asking about the registration window for the Intermediate Course. Well, thought I'd take some time today and give you the "scoop". Last year, I offered the Intermediate Class for the first time...and had about a dozen ladies sign up for this pilot class. We had a wonderful time, and they did some amazing and beautiful work during the Autumn and Winter months. While I "thought" that I had done a good job of limiting the class to just the basics...it was quickly apparent that there was just TOO MUCH information to have just a continuing single class. AND, I had a second problem...what was included was just a small fraction of what I WANTED to include. So, after much thought and pencil to paper...I have developed a plan. I'm going to be offering a series of Intermediate Level Classes. If you choose to take them all...you could consider it a "Course". Each class will have parts or tasks...and you receive the next task as you complete the prior one...same process that I use in the Basic CQ Course. 1) The classes are held on a private blog...which works a bit differently than a public blog. 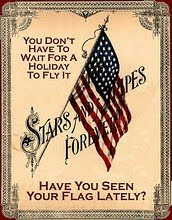 In the Basic CQ Course, each student learns how to properly get registered and use the blog for class. This sounds simple...but takes several days for some students to work out the "bugs" of actually getting logged in and maneuver around the site. So, by requiring this basic class first...students will know how to use the blog as a teaching/learning platform...and I will not have such a high curve of "getting started" in the intermediate classes. 2) Tasks are completed and photos are published to the class blog. Feedback comes from me in the form of comments; and from other students in the form of positive remarks. Subsequent tasks are emailed upon completion of the prior task. This method of processing through a course curriculum is new to most. It is my "method of teaching" and having the basic course allows everyone to have a good working knowledge of my teaching methods and the rhythm of a class taught by me. 3) Information presented in the Basic Course will not be repeated in the Intermediate Course. But, the information will be built upon. 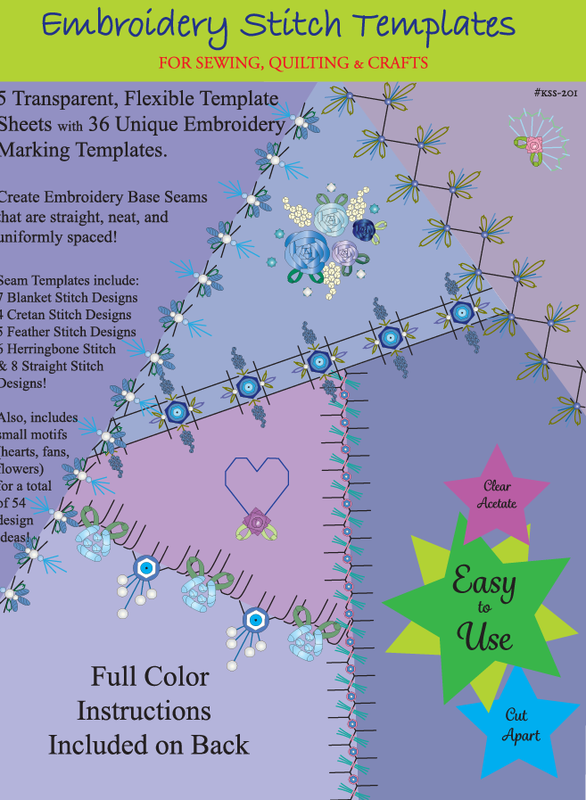 So, students that do not get the handouts on Templates, Embroidery Stitches, Ribbon Stitches, Basic Design Principles, etc. will not have these to refer back to in the Intermediate Course. 4) The Basic Course has nothing to do with a person's skill level. It can be taken by anyone. If you are comfortable with the material provided you can move through the class in a couple of weeks. If you have more constraints on your time or your talents...you can use the entire 12 weeks provided in the schedule for you to complete the course. 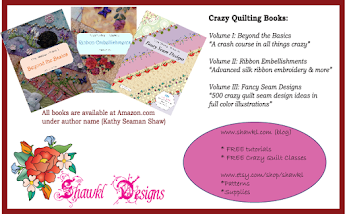 Okay...this is getting long winded...so let me just end by giving you my proposed breakdown of Classes for the Intermediate Crazy Quilt Course (ICQC) upcoming Classes. I would love to hear your feedback and ideas about this proposed Course content. If I've left out an element of CQ work that you want to know more about...let me know. These classes may overlap in the scheduling...and will not be offered in order necessarily. These will be technique classes and not have to rely on each other as a rule. But, having a block to work or practice on is important...and understanding COLOR THEORY is even more important...so I am making the ICQC-101 Class a per-requisite for the other ICQC Classes. The others can be taken in any order however. Registration for the ICQC-101: Piecing Crazy Quilt Blocks Class will open on 26 February...so mark your calendars. I will provide a general supply list for each course prior to registration. Some are still being worked out...and when they are all completed...I will also post them on the blog under the Classes Page. As of now, I'm still in the planning or editing phase for each. They will be announced as they are completed. If you have taken the Basic CQ Course...then you know how detailed and complete my instructions are...so these students will understand that it takes time to do this writing and stitching of the models. The rest of you...well, you'll just have to trust me that it will be worth your time. All of these classes will be FREE...at no charge. There will be a need for supplies of course...which will cost money...unless you have things in your stash that you can use. Hopefully, you will! I'm also okay with you substituting different colors of ribbon, paint, dye, etc. My goal is to share information and yet, not require you to mortgage the house to learn new techniques. Now, that's not to say that a "GOOD SIZE STASH" is not worthwhile...because it most certainly is! And, I'm all for Shopping Trips! And mine are all usually on-line...Ha! Wow! This is exciting news! Can't wait to sign up for class since I missed the deadline on the current class. This will be so much fun and will take my crazy quilting to a whole new level. Thank you! Better make sure I finish that Beginners Course before Feb 26th! Looking forward to extending lessons with you. I guess I will have to find a silky that I like somewhere, not my thing really, but maybe it will be after this! Thanks for all the work you do for all of us! Merci. Wow, you really have thought this all out. I hope by the time the registration begins, I will have some time. Looking forward to joining your next class. Is the mandatory color theory going to be 12 weeks, too? I know I will be travelling, but I still hope to take your course. We start travelling tomorrow... Yippeee. Kathy you know I am up for all of the classes. 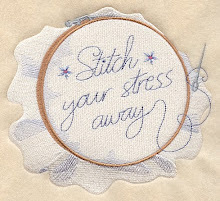 Once the kinks get smoothed out will you be doing a class more in depth for Stumpwork? Woohoo! Sign me up please! (Do I get a star for not asking every hour, "is it ready yet? now? is it ready yet?" :) I so excited to be learning from you again! Love ya! Candy L.
This sounds fantastic. I can't wait to do them all. Thank you for (I imagine) the large amount of time that you have put into all of these courses and still offering them for free. If you ever need help with anything, I'll gladly do so. So very very excited Kathy!! I thoroughly enjoyed the intermediate class! I like that you give parts as a task is finished....keeps me focussed! it all looks wonderful and so grateful for your generosity is teaching all of us! Marking my calendar now! I like the idea of focusing on one technique at a time. Calendar marked! The countdown to Feb. 26 has begun! Such exciting details; I love the idea of different segments for the intermediate class. With all of our busy lives it is wonderful to have this shorter option. Any chance to add your tips on printing silkies in one of the segments? Thank you, thank you for all your work and sharing! What a wonderful outline of classes - can't wait! Along with your style of superb teaching, you give us "a purpose in life that's meaningful" plus things to look forward to! How I now wish I had given up on sleep/eating/living long enough to take the beginners class so I could join in this exciting new format! It sounds wonderful Kathy and I know people are going to be so thrilled with it. Maybe you will offer another beginners class and I will be sure to sign up so I can then take this one! Kathy, this is fantastic news!! I already marked my calendar. I am in your beginners course and love you teaching style. It is very thorough! Thank you for your generosity! Well I'm about to put Feb. 26 on my calendar. I'll definitely have to step up the pace in the beginner's class. Want to get finished close to then. Loving what I am learning already and would not miss out on this opportunity. Kathy, I hope I can take all of these wonderful sounding classes. I have signed up for the 2015CQIJ, taking Allie's class and starting a RR, which I have never done before, so I have to make sure I have the time, but I am pretty sure I can find the time for your class - your first one was so valuable! Thank you Kathy, I have marked my calendar! Well it looks like I need to take your Beginners class so I can join in - looking forward to hearing when you will start the next Beginner Session :) I've seen so many of your students work on FB - you must be so proud of the beautiful work that your lessons are producing! Sounds great, Kathy! Can't wait to finish my CQBC block, so I can join this new adventure and learning more about CQ! I like your proposed format. I think that being able to jump around after the first segment could be useful. I love your teaching methods. You make it very easy to follow and being left handed wasn't an issue. Have I told you just how fabulous a person you are lately! You have more energy than the energizer bunny! You are doing a great work for all crazy quilters! I have been sent the link to your blog and can't wait to sign up for the basic course. I am a total novice and have everything to learn. At the rate I'm progressing in the BCQC, I'm afraid I won't be done in time to join the first intermediate class. Better get on the ball.